Hardcover, 8 in. x 10 in. "[Ludvigsen's] grasp of the fine technical details and developments, and his behind-the-scenes knowledge of the drivers and manufacturers, is unrivalled. . . This definitive book is essential reading for anyone who enjoys motor racing and wants to learn about the glorious heritage of the Grand Prix race car." Classic Grand Prix Cars explores the origins and evolution of Grand Prix racing during the first half of the twentieth century. With a newly expanded introduction for this edition, Karl Ludvigsen's authoritative history describes the technical development of these powerful machines, decade by decade. A former auto industry executive and award-winning author of dozens of books, including Classic Racing Engines, Ludvigsen is an expert guide to the cars, manufacturers and drivers who pioneered the sport that would become Formula 1. 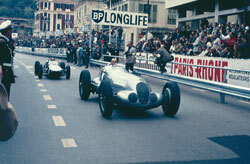 Front engines dominated the top tier of motor racing from the first Grand Prix held in France in 1906 through most of the 1950s. Ludvigsen describes the conception and construction of these ground-breaking vehicles, spotlighting the many remarkable advances in chassis and engine technology that were made during Grand Prix racing's first few decades. 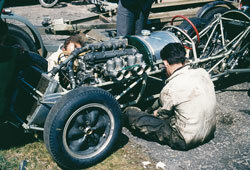 The final chapters of the book introduce the game-changing move to rear engines in Grand Prix cars after the Second World War. Ludvigsen's thoroughly researched text is augmented with hundreds of archival photos, illustrations and blueprints along with color photos of many of these historic cars in action. 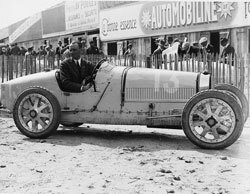 Lending further authority to his history are dozens of first-hand-accounts of early Grand Prix competitions as they appeared in the leading automotive journals of the day. 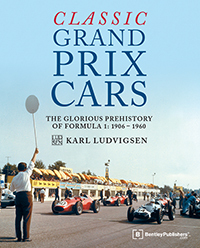 Karl Ludvigsen's celebration of the innovative early years of the Grand Prix car makes for fascinating reading as well as providing a lasting reference for all F1 fans with a sense of history.